Trump, Bibi, and myths of the Israeli-Palestinian peace process. How renewed violence in Israel and Palestine could bring us closer to peace. U.S. President Donald Trump, Israeli Prime Minister Benjamin Netanyahu, and Palestinian President Mahmoud Abbas. Photo illiustration by Slate. Photos by Chip Somodevilla/Getty Images, Abir Sultan/AFP/Getty Images, Prakash Singh/AFP/Getty Images. A centerpiece of President Trump’s first foreign trip since being inaugurated will be a stop in Israel, a country that he has closely embraced. However, after hugging Prime Minister Benjamin Netanyahu throughout the campaign, Trump caused a diplomatic incident by revealing Israeli intelligence to Russian diplomats and is apparently reconsidering some of his more extreme campaign proposals, such as moving the United States Embassy from Tel Aviv to Jerusalem. 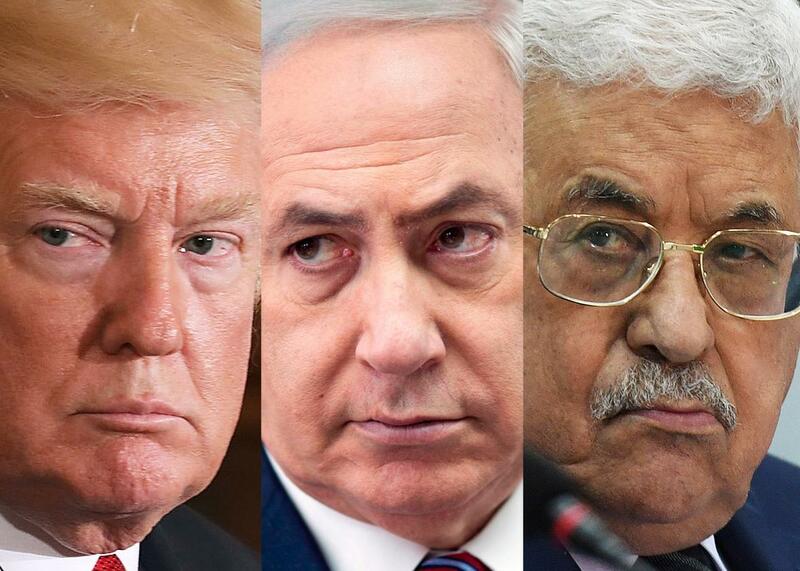 Now there is a fear among some right-wing Israelis that Trump will push the Netanyahu government to make peace with the Palestinians. And it’s the subject of peace—and the so-called peace process—that Nathan Thrall’s new book, The Only Language They Understand: Forcing Compromise in Israel and Palestine, examines. Thrall, a Jerusalem-based senior analyst with the International Crisis Group, looks at his subject from a unique perspective. His book argues that our general understanding of the conflict is warped and that until the status quo becomes more difficult for Israel—something he believes can only really occur with increased American pressure and confrontational Palestinian behavior—peace will never be achieved. I spoke by phone with Thrall on the eve of Trump’s trip. During the course of our conversation, which has been edited and condensed for clarity, we discussed why the two-state solution is more likely than people think, why Trump’s unique opportunity to foster peace is likely to go unrealized, and how Netanyahu adeptly ensures his own political survival. Isaac Chotiner: What is it about this conflict that you think is most often misunderstood or misinterpreted? Nathan Thrall: That’s a very good question and not one I’ve actually been asked before. One of the central myths is that the United States is incapable of forcing a solution, that the U.S. can’t want it more than the parties, and ultimately, if they’re going to make a deal, they have to both desire it, and the U.S. can be nothing more than a facilitator. This myth is also often paired with a related myth, which is that every time Israel and the Arabs have made progress, it’s been in the absence of the U.S. So Oslo was basically a mystery to the U.S. until it was nearly finished. This line of argument says that the Camp David agreement between Israel and Egypt was basically brought about entirely through Anwar Sadat’s visit to Jerusalem, and Carter was more or less an afterthought who just happened to be at the right place at the right time. In fact, Carter exerted more pressure on Israel than any U.S. president has since. Without the extraordinary pressure that Carter applied on both parties, there wouldn’t have been a Camp David agreement. This seems to relate to your other argument, which is that when the status quo is acceptable, there won’t be peace. The international architecture around this conflict is basically designed to mitigate it but not really resolve it, so to basically keep the elites on both sides happy and saying, “Yes, they’re struggling for their larger goals, but we’re just going to try and keep calm on the ground.” What I try and show is that, in fact, it’s been when there is no calm on the ground that you’ve seen the most progress. That’s actually when the international community, and the U.S. in particular, has been shaken from this default policy and strongly attempted to intervene, which itself has had dramatic consequences. One example of that is the Second Intifada, which is typically cited as an example of a disastrous Palestinian decision that set them back terribly and accomplished nothing and proved the futility of violence. But in fact, out of the Second Intifada, the Palestinians achieved quite a bit. This is related to [another] big myth that I’m trying to attack. It is the notion that violence never works or terror doesn’t work. There’s a huge taboo in discussing this conflict and talking about the efficacy of violence. When I first came here and first started reporting here, I was struck by how much certainty I heard about how violence, of course it doesn’t work, and the Second Intifada proved that or other events have proved that. I feel strongly that that’s not the case and one of the things I try to show is that there has been incremental progress. Much of it has come about through violence, including during the Second Intifada. Why won’t violence have the predictable effect of turning Israel to the right and making them less likely to seek peace? What you often see is that when there is violence, there is immediately a strong Israeli reaction and the population is united around that reaction, so there’s a short-term escalation. But there is a longer-term effect, which I think is more important, which is a desire to separate and be rid of this conflict and be rid of the enormous cost that just showed itself through the violence. I’m not a person who puts great stock in public opinion polls. Nonetheless, when you look at polls of, for example, Israelis accepting more or less the Clinton parameters, Clinton’s proposal of December 2000, you find that these polls were taken during the Second Intifada and the peak support came in March 2002, which was at the height of violence during the Second Intifada. Our intuitions often are wrong about these sorts of things. The other myth that I’m attacking is what’s become a kind of a conventional wisdom among analysts, which is to describe the situation as a one-state reality. I don’t really have a problem with that description, but then people go further and to say, “And it’s all headed toward one state inevitably.” If you take a step back, I think a lot of that sentiment comes from a place of frustration, but not real historical scrutiny. Because they’re frustrated with Netanyahu, who appears to just want to keep the status quo in place, people feel things are just deteriorating. If an alien comes down and looks at these two populations, do they look like they’re living more in two separate entities or the same one? There’s no question that, from ’67 until ’87, it was a one-state reality in a much stronger sense than we have today. I’m rambling and going into too much detail, and I appreciate you pulling me out. I will just edit out everything you say. OK. There are two pillars of this conventional wisdom that it’s inevitably headed toward one state. One is about the population growth in the settlements. The second is that the country is becoming more right wing. That also is not exactly right. Yes, the Likud party is very strong. Yes, the settler lobby has more or less taken over Likud out of all proportion to their actual demographic weight. But at the same time, objectively, Israelis as a whole, their positions are moving steadily toward the decades-old international consensus around two states and dividing Jerusalem and so forth. It was not so long ago, it was in the late ’90s that the Israeli Labor Party opposed Palestinian statehood. Now, the Likud prime minister is endorsing it publicly. Of course, it’s cynical, et cetera, et cetera, but there is something real there. What then do you make of Netanyahu’s ironclad control on the prime ministership over the -past several years? He is at core a centrist who is guided far more by polls than by ideology, which is the real reason he is still there. Netanyahu has kept winning not because he is so right wing but because he is able to seem right wing enough to the mainstream Likud while still appealing to some of those centrist voters. In many respects he is the perfect embodiment of the Israeli center and all its contradictions: He was in favor of the Gaza withdrawal before he was against it. He was against Oslo before becoming prime minister and advancing it. He vowed to get rid of Hamas, but once he had the opportunity (in two separate conflicts), he didn’t for a moment consider getting rid of Hamas because it would mean reoccupying Gaza. He is rhetorically against Abbas, except his true preference is for him to remain in power as long as possible. He is content with the status quo but vaguely in favor of two states, so long as it doesn’t entail too many sacrifices. He is disinclined to make concessions unless he is compelled to, and yet he will do whatever it takes to avoid absorbing the Palestinians of the West Bank and Gaza into Israel. OK so what does that mean in practical terms? In practical terms, what it means, and why there’s so much pessimism today, is that there’s so much quiet in the West Bank, so there’s not a strong incentive to change things and to pull out. You wanted to leave Gaza in the middle of the Second Intifada when young soldiers were getting killed, and you are asking yourself, “For what?” It’s to protect a very small population of 8,000. Then, you were willing to continue—“you” being the Israeli public—were willing to continue and do a huge withdrawal in the West Bank. That was the campaign platform of the party that won overwhelmingly in 2006. This was all coming right at the end of the Second Intifada. Since then, we’ve had a period of great quiet in the West Bank thanks to, in part, security cooperation between the Palestinian Authority and Israel. Israel feels very little incentive to change that. So then if this is the problem, what are you suggesting the various parties do, starting with the United States? What I think ought to happen is different than what I think will happen. I think that the U.S. is capable of twisting arms and making an agreement happen. I also think that Trump is basically the only American political figure that you could imagine possibly doing it. Not that I’m predicting that he will, but in his case, it’s at least imaginable whereas if Hillary had won, there’s just no question it wouldn’t. It’s not that he’s so pro-Israel that he’s able to do it, although I think there is something to that. I think it’s more simply that he’s so wild and unpredictable, and if he truly does look at this as a real-estate transaction as people around him seem to suggest that he does. The fifth chapter of his book is called “Use Your Leverage.” So he ought to understand that the U.S. has a tremendous leverage over both Israel and the Palestinians. All I’m saying is in his case, it’s actually imaginable because he’s such a freakish figure who will not honor the wishes of the mainstream foreign policy establishment. So then what should happen? I think that the U.S. has every ability to exercise its leverage, and I think it’s extraordinarily unlikely in the near term that the U.S. will do it. Now, what happens when that pressure doesn’t come? When Palestinians lose hope that there’s any chance that some outsider is going to help bring about their liberation, that is when you see violence erupt. They don’t have the strength to sustain it. They can’t actually accomplish their goal. But what they do is they engage in these periodic bouts of violence, and I’m sure that there will be another one. When it will be, I can’t tell you, but for sure there will be another. I’m also quite sure that if they’re able to sustain it for some time, I don’t know what that is, but let’s say a year or two, they can get some gains from it because that’s what’s happened in the past. Not their full liberation, but Israel then wants to negotiate some kind of better situation for them in order to stop the violence. That’s the kind of staggering progress that you’ve had in this conflict with periods of stasis, a bout of violence, everybody freaks out and tries to come to intervene, to change the situation in some significant way in order to end the violence, and that is how you’ve had incremental change that is slowly leading to greater and greater separation between the populations that, in my view, is eventually going to lead to two separate entities. Whether the Palestinian one will satisfy your and my criteria for calling something a state is an open question. But the fact that the two are separating and the Palestinians are going to have more territory, to me, I think that is almost inevitable. Are you cheered by or depressed by this vision? I’m cheered by the end state, but I’m depressed by the fact that, by far, the most likely way of getting there is through several more rounds of bloodshed, because what could prevent the bloodshed is a strong intervention from the United States, and I don’t see that happening in the very near term.